For vacationers dining out is as alluring as time spent on the beach. At Our Lucaya Beach and Golf Resort the choices are numerous. With fourteen restaurants and bars scattered over the resort no vacationer will ever go hungry. Top chefs and expert wait staffs from around the world have been brought to Our Lucaya in order to provide visitors with five star dining experiences. Different themed restraunts and genres of food preparation give guests a unique dining experience every time the stomach rumbles. Besides delicious Continental and Bahamian cuisine the Arawak restaurant comes with a beautiful view as well. Vacationers can enjoy an elegant meal while overlooking the 18th green of the Lucaya Course. In the mood for steak that will melt in the mouth? Churchill?s Chop House offers not only aged Angus beef but also fresh seafood caught off the shores of Grand Bahama Island. The decor is rich and stately and the food is phenomenal. After dinner enjoy a nightcap at the Churchill Bar located in the Manor House. Portabellos is another fine dining establishment at Our Lucaya. Here Italian is the specialty with a unique focus placed on the Tuscan region. Diners are invited to watch the preparation of their meal thanks to an open aired kitchen. Throughout the week Portabellos also offers several wine tastings. Vactioners are invited to come and sample some of Northern Italy?s finest wines. China Beach offers guests a choice of several Asian recipes from a central cooking station. Methods of food preparation include stir-fry and teriyaki grilling. For those who enjoy raw fish a wide variety of sushi and sashimi are also available. The Chine Grill serves up cocktails and traditional snacks with a touch of Asian flair. 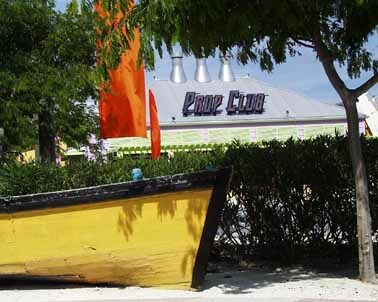 For guests who want to inhale as much of Bahamian food as possible Iries is the place to go. From the decor to the food this restaurant oozes Caribbean flavor. For a delicious and unique burger visit Barracuda?s. At first sight it may appear to be simply a 50?s Style American diner. Look closer and touches of the Bahamas can be seen everywhere. In the mood for a more relaxed dining experience? Our Lucaya offers plenty of options for a casual yet tasty meal. 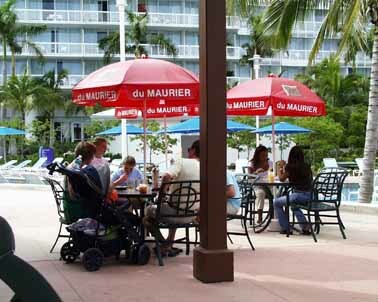 Sugar Mill Bar and Grill is the perfect place to enjoy a sandwich and drink after a day of fun and sun. Cool off with a frothy beer at the Reef Golf Club after finishing up 18 holes. 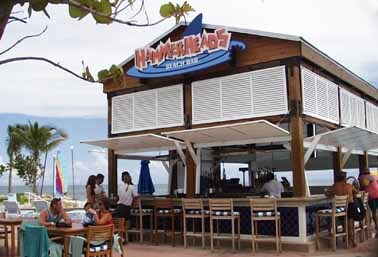 Admire the beautiful sunset over crystal blue waters at Hammerheads Beach Bar. Pick up a fine bottle of wine from Havana Cay Cigar Bar and take a romantic, moonlit walk on the beach. 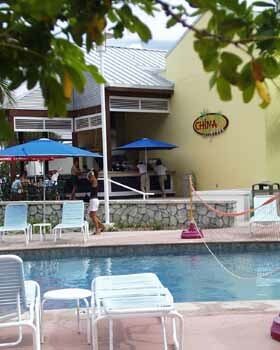 For a quick bite to eat and refreshment, Waves Bar and Grill, located close to the Serpentine Pool, offers a wide variety of snacks and beverages. To get a jump-start on the day, On Higher Grounds serves up gourmet coffees and espresso as well as fresh baked goods each morning. Try something different and tackle the buffet at Willy Broadleaf?s, where a plethora of cuisines are prepared from around the world. Once the sun sets and bellies are full the Prop Club is the place to be at Our Lucaya. This unique venue is an outdoors sports bar and dance club rolled into one. Play a game of beach volleyball on one of the two sand courts or boogey the night away to Caribbean flavored music. Belt out a favorite tune at Karaoke night or sample the different rums Grand Bahama has to offer. No matter what choice is made, fun is the guaranteed result.